It’s an unwieldy name with a history to match. People's Music Network for Songs of Freedom and Struggle (PMN/SFS) began as Songs of Freedom & Struggle, a weekend gathering at The Community for Non-Violent Action (CNVA), a conference center in Southeastern CT. Charlie King, Joanne McGloin, Rick Gaumer & Joanne Sheehan were on staff in 1977 planning summer conferences, and the four agreed a gathering of singers was in order. The radical movements and music of earlier decades had been pushed from the mainstream to the margins by the years of Nixon, Ford and a self-congratulatory US Bicentennial. Many singers felt isolated or ignored (though the women’s music movement had a strong sense of community as we learned at that first gathering). Invitations went out at the beginning of the year and additional names were added as many singers converged on the Seabrook Nuclear Power plant for the Great Occupation, May Day 1977. By June roughly 75 musicians responded to the call and gathered for a weekend that created a template that has guided us ever since. Folks trickled in, settled down and got to know each other Friday night. Saturday was filled with daytime workshops and songswaps. Saturday night was a round robin sing - literally a circle of 70+ singers who each sang (and/or led) a song in turn. When one singer wanted to jump the line everything ground to a halt. A lively discussion ensued. It lasted close to an hour! Michael Cooney tried to calm the waters by walking to the center of the circle and leading us in “Tis A Gift To Be Simple - after which the argument picked up where it had left off. Forty years later we’re still experimenting with ways to get the most people a chance to sing in the most reasonable amount of time. SFS met for three consecutive summers in rural settings. In year four we experienced a seismic shift when Pete Seeger became a regular attender at the gatherings. He immediately challenged us on the lack of diversity in our mostly white, Anglo, middle class ranks. He suggested an urban weekend would be a more accessible setting for diverse attendance. 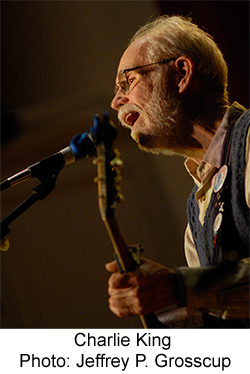 Although inspired by SFS members, the 1981 Winter Gathering had a life and an organizing base of its own - and a new name: The Peoples Music Network. PMN & SFS continued to move in tandem, SFS organizing the summer weekends while PMN planned the winter urban gatherings. Eventually the two merged, but not quickly and not without a lot of back and forth about how to build a network that was a diverse embodiment of the values we espoused. It’s a challenge we continue to struggle with today. At its height the Network had about 800 members, many making their living as full time performers. Other networks spun off the original: Midwest PMN; San Francisco’s Freedom Song Network; and a national group, The Children’s Music Network. The Gatherings have been a spawning ground for songs that, once heard by 200 or so other singers, were soon being heard around the nation and the world – the 20th century acoustic version of going viral. 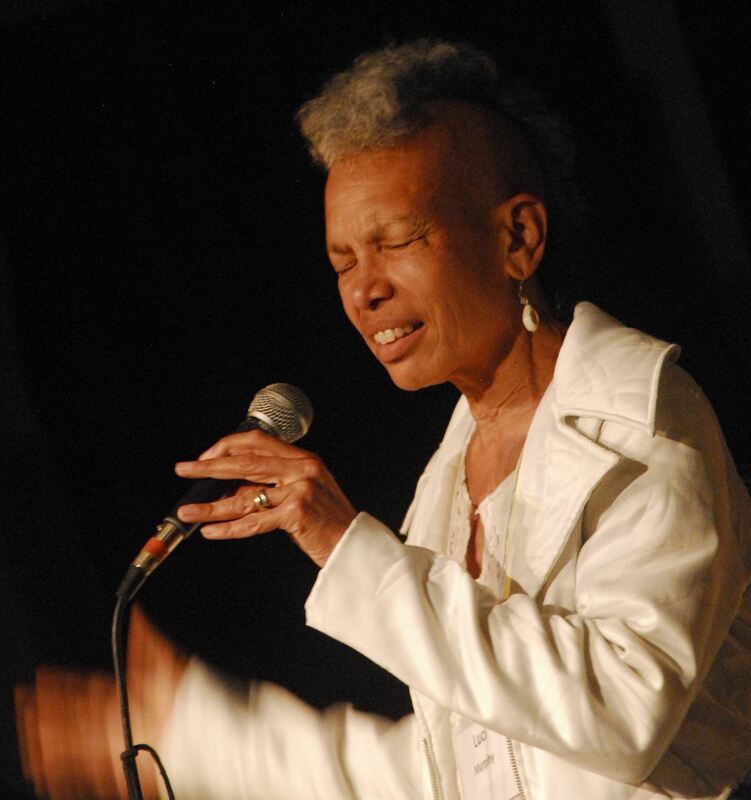 Pat Humphries, Fred Small, Ruthie Pelham, Roy Brown, Kim & Reggie Harris and many more brought songs to the gathering that took on a life of their own. And lesser known novice singers who found their first audience at a PMN/SFS song swap or round robin may have stumbled but were borne up by 200 supportive voices and carried through to the end of their song, only to come to the next gathering with more experience and confidence. Songs were heard, critiqued, emailed back and forth, adapted for other causes and, with luck, ended up in Peter Blood and Annie Patterson’s compendiums, Rise Up Singing & it’s successor, Rise Again. PMN/SFS created a virtual community of mutual support. Traveling performers could find a venue or a couch to sleep on by contacting members on the far-flung national list. Many have performed at The Peoples Voice Café’ in NYC, also a Network spinoff. Connections were made between activists groups and cultural voices that enrich their organizing. At its best, PMN/SFS can create a community of cultural workers where no one feels they are going it alone and where music and poetry enliven political struggle. We continue to struggle and make progress with issues of diversity as we move closer to our first half century mark. We hope those who visit this website will be a part of creating that renewed Peoples Music Network for Songs of Freedom & Struggle.